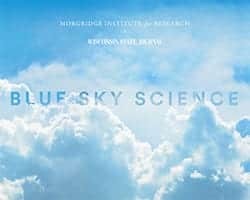 News & Stories > Blue Sky Science > How do plants grow if there’s no sunlight? Plants need sunlight for a process that we call photosynthesis. Plants are what we call autotrophs, meaning they’re self-feeding or self-nourishing. They basically create their own food or energy to grow. Plants using photosynthesis will take in carbon dioxide from the air, bring up water from the roots, and use sunlight as the energetic source to create sugar from water and carbon dioxide. Plants contain a molecule called chlorophyll, and the chlorophyll is what absorbs the sunlight. The chlorophyll absorbs red and blue light, and they reflect green light. That’s why if you look at plants, they appear green to our eyes. That chlorophyll absorbs the sunlight and excites electrons, and the electron is what is used to create the sugars or food for the plant. Some plants don’t contain chlorophyll. There’s one plant called the ghost plant, and it appears white in appearance. It doesn’t have any chlorophyll. Instead it’s a parasite that leeches off of other plants for nutrition and energy. Some plants can survive in very low-light conditions. If you think about dark, rainforest canopies, there are plants that grow in that environment. They have evolutionary adaptations to handle these low-light environments, which include making broad, thin leaves to capture as much sunlight as they can. But basically if a plant is green, it needs sunlight at some point to grow. Otherwise, it can’t survive.